Una giornata ricissima ricchissima! Ahem. This (and next) week’s Friday Boot: Pistoia, Italy, 8 July 1982. As some of you old-timers may recall, there used to be a Frank Zappa image gallery around here back in the day (it was the year 2000, this site got about 10 visitors a day, and my ginger-tinted beard had yet to come to fruition). As time passed and the galleries became cumbersome to maintain, and since there was/is a plethora of Zappa pictures floating around the interwebs anyway, I decided to just lay that feature to rest. Here’s two photo-sets that I deemed worthy to re-publish from Ye Olde Obsolete Zappa Gallery: Zappa live in Vorst Nationaal (Brussels ’82, ’84) and Zappa at the Yellow Shark press conference. Both photo-sets were kindly sent to me by (and are copyright) Dirk Laforce. Enjoy! 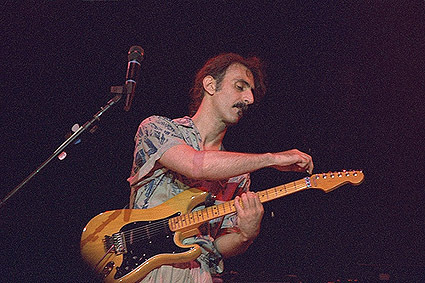 So I post an entry linking to David Ocker’s blog, who in turn links to Duncan’s Zappa-page, which in turn links to his weblog where today’s post links to some cool YouTube footage of Artis The Spoon Man — but only because I asked. I don’t usually post about Frank on my own blog but I just did a long article entitled “Varèse, Zappa & Slonimsky“, which I would hope some of your readers might find interesting. What better way to exercise Conservative Family Values than to have a stash of illegally obtained Viagra sitting in your pocket? Just make sure you don’t get caught though, Rush! The bandmembers: baffling musicianship, very tight playing. Dweezil: wonderful guitarplaying, obviously doesn’t have the onstage presence/humor of his dad, and was wise enough to acknowledge this by just being himself. Napoleon M. Brock: vital to the group, probably everyone’s favorite throughout the tour. The sound: consistently way too loud, with vocals and musical subtleties getting lost in the mix. The conclusion: we want more! Now it’s on to October 18 when another 10 shows kick off. The chord is like the establishing shot in a movie–where you see the exterior of the building, or the alley with the garbage cans. It tells you where it’s happening. Then the action takes place. So you have a chord, and you have three notes that provide certain types of emotional activity versus the chord. And that emotional activity is redefined every time you change the order of the notes and the space in between the notes. (…) But what’s really happening in the solo is this: for each harmonic climate that’s presented, there are experiments being conducted, in real time, with different notes and weights and measures of those different notes, versus the climate. And every time you change the position of the note, it has a different impact. Between 24 July and 4 August 2006, The Extreme Cellists will visit all 42 English Cathedrals with the aim of playing on the roof. Yes, that is correct – we will play at 42 Cathedrals in only 12 days. This will involve over 1900 miles of travelling (that’s an average of more than 150 miles a day), visiting almost every county in England, climbing countless stone spiral staircases, and offering lots of prayers for dry weather! Need to put a moustache on something? iStache is the app for you! Take the line-up featured on FZ:OZ, add Norma Bell and Eddie Jobson, et viola — this week’s Friday Boot: Hamilton Canada, December 7 ’75.